With gleaming glass you get precision window cleaning services. Our technicians are incredibly gifted when it comes to providing Precision window cleaning services for our Tulsa window cleaning customer. Our technicians are so precise when cleaning windows at their eyes are trained to stare at the tip of the Leading Edge of the squeegee to make sure it makes its way right into the corner of the window and slides down the side of the glass as close to the frame as possible so as not to leave behind any streaks or water with soap. Talk about Precision window cleaning! It’s incredibly hard to find Precision window cleaning services and other Tulsa window cleaning companies. Not everyone cares whether or not they leave behind window cleaning Street or drip dirty water on your white carpet. We assure you no other window cleaning company has technicians that are as precise as ours when it comes to offering Precision window cleaning services. In addition to pain great attention to detail as they are squeaking off the dirty water from the glass they will also wipe down the entire pane of glass with a hot towel and some special glass cleaning solution to get rid of any streaks we may have left. We have become so proficient in providing Precision window cleaning services that we’ve rarely leave behind window cleaning streaks. However, it can happen from time to time as the squeegee rubber blade wears down from rubbing against the frames of the window. With every time the squeegee rubber contacts the window frame it wears down the corners of the squeegee rubber. There comes a Tipping Point when the squeegee rubber has been worn down so much that it starts to leave behind a streak right where the rubber is worn down. Also, if you happen to have any construction debris such as concrete brick mortar or paint overspray on the glass these foreign degrees can cause little knicks in the squeegee rubber causing a streak to be left behind. As the window cleaning squeegee blade is dragged across the window it pushes soapy water down the class however if there’s a knick in the squeegee blade soapy water will escape through that little knick and will show up as streak on the glass as the squeegee blade moves across the window and leave behind that trail of soapy water. It can be hard to find a Tulsa window cleaning company that has the diligence and willingness to take the time to wipe off these remaining streaks but those are exactly the qualities you will find when hiring a gleaming glass window cleaning Tulsa technician. We offer quality window cleaning services and work and no hurry to get to the next job because we try to only book one to two jobs for day. However, we price those jobs well so that were able to make enough money even whenever we take our time and do an exceptionally good job offering you Precision window cleaning services. 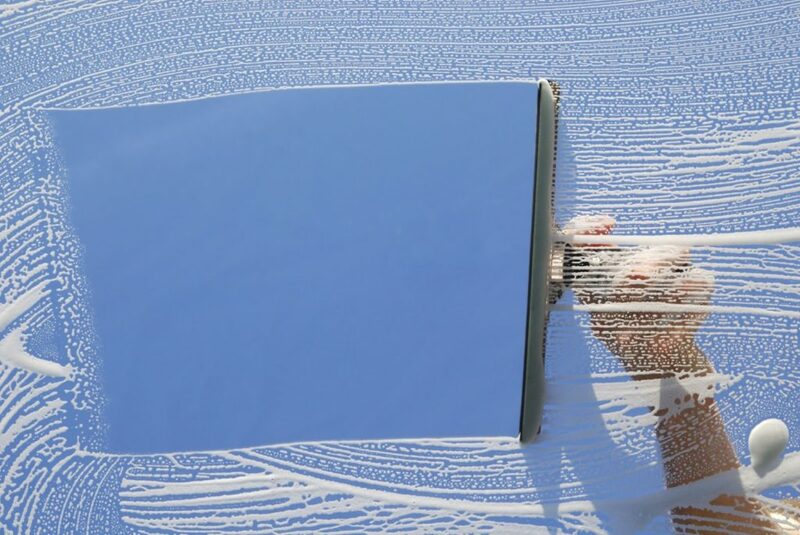 In addition to paying great attention to Define details that go hand-in-hand with window cleaning and making sure that we don’t leave behind any streets on your windows, we also make sure that any soapy water that drips off the squeegee onto the window sill below the window is wiped up immediately or as soon as possible. I can’t tell you how many times I’ve come across a customer’s windowsill that had the window above it previously claimed by another Tulsa window cleaning company, and they just left there dirty soapy water drops on the wooden window sill below for the sun to dry out. After these drops of dirty soapy water dry on a wooden window sill they stain the wood, for lack of a better word. It almost looks as if the spot where the water dried on the wooden window sill is permanently wet. This is evidence that other Tulsa window cleaning companies do not offer the same Precision window cleaning services as gleaming glass. Some people in the Tulsa area would rather just hire a window cleaning company that charges insanely cheap right but doesn’t offer the quality services that we offer. When you pay incredibly cheap prices for professional window cleaning services in Tulsa you need to be prepared to expect sloppy work like window cleaning streaks on the glass or dirty soapy water drip stains on your wooden window sills or clean white carpet. Our technicians are trained to avoid these situations exactly. In the event that we leave behind window cleaning streaks, simply let us know that you’re not completely happy with her services and we’ll be happy to come back and and clean off any window cleaning streaks we may have left. Now that’s what I call Precision window cleaning services!